I'm obsessed with neon lately. Neon everything. Neon office supplies. Neon clothes/accessories. Neon housewares. I decided I needed some neon in my life, but for cheap. 1. First I thrifted an XXL mens cotton tshirt in the most obnoxious neon shade I could find. 2. Then I got my scissors out and cut the shirt, from the bottom up to the armpits. 3. Each strip (in fact, large loops) I stretched until all the jagged edges curled into hiding. 4. 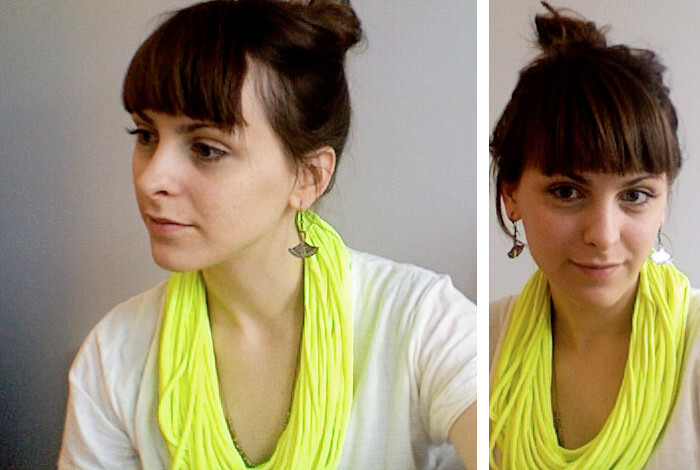 Combine all the loops and... Presto neon yellow infinity scarf! Total cost: $1.99 (for the shirt).